David Bleakley provides a description of Strandtown in ‘C.S. Lewis, at home in Ireland’. The cluster of people and cottages remained relatively unchanged for many centuries, occupying part of a long stretch of beach running from the nearby town of Belfast and known as the Long Strand, hence Strandtown. One of the early big houses was known by that name and occupied a prime site at Gelston’s Corner in the centre of the village – an important gathering point then and now. 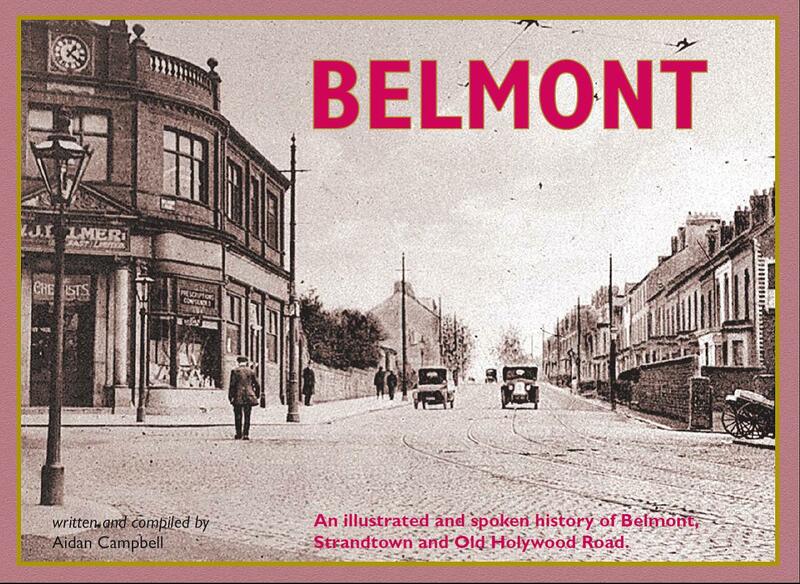 Holywood, like Strandtown, managed to absorb its newcomers and still retains many features of its ancient past. But being closer to Belfast the pace of change was quicker in Strandtown, and the surge of the Industrial Revolution changed the tenor of life in Strandtown as ‘Big Houses’ with their attendant support staff were erected throughout what was becoming a select residential area. So Strandtown in the late 18th and early 19th centuries was becoming a desirable place in which to live, for what was then the ‘new rich’. Their properties and estates were formidable in size. A local builder (born in 1906) told me that on the site of one such mansion ‘Ardvarna’ (see Belmont p. 84) which he acquired for development in the 1960s, he was able to erect 57 substantial dwellings on the surrounding land. In ‘Edwardian Belfast. A Social Profile’, Sybil Gribbon mentions: The hierarchy of class dominated Edwardian society. 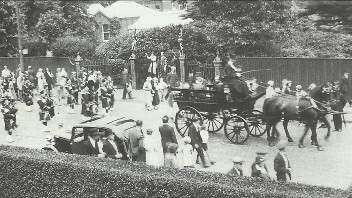 At its apex were the three hundred families, whose households at Strandtown or on the high ridges of the Antrim and Malone Roads contained a gardener and coachman as well as several indoor servants. In ‘Down History Society, Interdisciplinary Essays on the History of an Irish County’ there is a section on East Belfast by Stephen Royle and T.J. Campbell and some extracts are included: The wealthy people of Belfast owned numerous properties in the town in the 19th century. They followed the example of the landed gentry who had traditionally been seated in the country and moved out. The gentrification of Belfast’s rural fringe had its beginnings in the mid-eighteenth century, when leases were taken by gentlemen to replace those of farmers. The well drained sands and gravels of the County Down side of the Lagan Valley influenced the siting of demesnes, while topography, as at Strandtown or Knocknagoney could also have an effect. Developers tried to avoid low-lying land which might be subject to flooding. 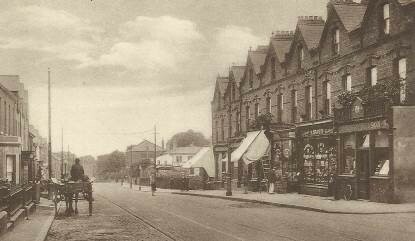 This is a view of a rather uncluttered Belmont Road looking in the direction of Gelston’s Corner. The electric tram traction poles suggest a date after 1905, with Bathgate Drive on the immediate right. The land just beyond the shops (right, just beyond the awning) was part of the ‘Sydenham House’ estate owned by Henry C. Craig, brother of Sir James Craig. A row of shops would be built on this site in the near future. The 10th Scout Troop in 1921 in front of a semi-detached property called ‘Dundela Villas’ located on Dundela Avenue close to a large house known as ‘Ballyhackamore House’. 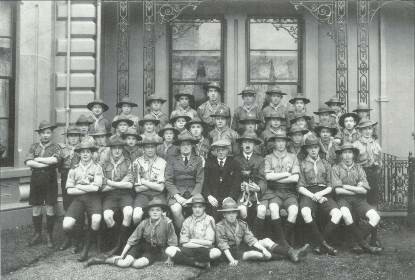 Scoutmaster Harry Keown is sitting in the second row (with moustache and holding dog) outside his family home. His uncle was Albert Lewis who, after his marriage in 1894, rented Dundela Villas from Thomas Keown, Harry’s father. Albert and his wife Flora settled at Dundela Villas. C.S. Lewis was born there on 29 November 1898. ‘Netherleigh House’ is a grand villa on Massey Avenue built in 1875 for Mr Robertson, a partner in the retail firm Robertson, Ledlie and Ferguson who operated the Bank Buildings department store at Royal Avenue in Belfast. Today Netherleigh is a Government Building and is the headquarters for the Department of Enterprise, Trade and Investment. Why was Gelston’s corner so named ?